Hair braiding is an art, a proud heritage, and a source of cultural inspiration. It is also fun and easy to learn. Hair braiding is today's fashion for every woman. Students who want to look hip, graduates entering the work force and style conscious woman on the go. They are all finding inspiration in Darling Hair Extensions, and loving it! 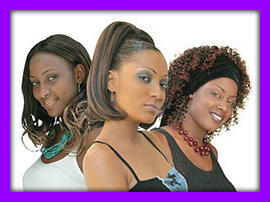 Darling best quality hair extensions are produced with the highest level of quality and care. With Darling Hair Extensions you can become a flaming redhead, or a dazzling brunette, in a snap. Darling hair is made from Japanese Kanekalon and Toyokalon fibres which are especially formulated to have subtle variations, like human hair. The Darling group has dedicated the last 20 years to the embellishment of African woman, is proud to always introduce new products to keep up its lead in the market.